What is the connector type at the top of the cable where it meets the headphones? The connector is a 4-pole 3.5mm 45 degree angled type. Please see the newsletter attached also for this. I can't see that newsletter. 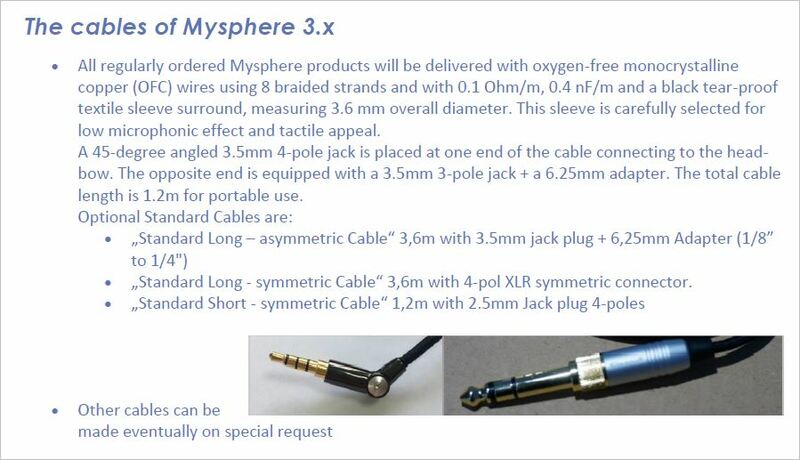 Looking at the Myspere website there will be both balanced and single-ended cables available (1.2 or 3.6m). The connection is on the headband and not at the driver (like most other headphones).Is a left or right connection possible or only one side? Also a good option is to subscribe to the newsletter in mysphere homepage. The single cable entry on the headband looks very elegant and I guess it increases the comfort wearing that headphone. I wonder how the left/right drivers (which are moveable and easily disassembled) are electrically connected to the headband? The complete wiring of Mysphere 3.1 / 3.2 is new and we applied for two patents. Please understand that I cannot release too much details now before the patents are granted. However, it's so, that even by connecting on the left or the right bow-end, the internal wiring keeps always exact the same length to both of the drivers. ruhenheiM and Matrix Petka like this. Sometimes it goes to spam folder so check there too. It happened to me for some reason. You should have received the confirmation request already!... Did you?? Yes, I got it. Thanks, Herr Heinz. Just wondering - maybe you have plans in the future to develop dedicated amplifier, something like Audiosphere BAP 1000? Of sure we will not develop own dedicated amps. But may be that amplifier producer like to partner with us towards a specialized amp. Matrix Petka and ruhenheiM like this.